Hey Dolls! I hope you are all doing great. Can you believe that we are already coming to an end of 2009? I sure hope that 2010 is a good year for everybody...I can honestly say that 2009 has not been the best year for me, but I am hopeful that 2010 will be an even better year. Here is a mini haul to show you gals and guys. I went to MAC and I got 2 items from the Warm and Cozy Collection. I got 2N lipglass (Love!-might go back and get a back up), and Feelin' Good Tinted Lip Conditioner. I love Tinted Lip conditioners, because they are so moisturizing and best of all they have SPF 15. 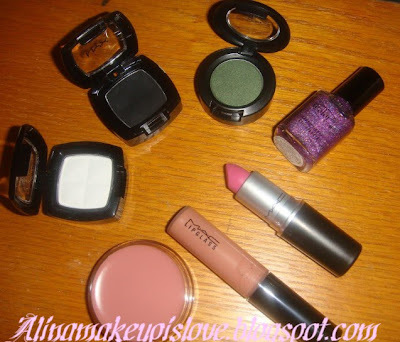 Along with that I also purchased Humid eyeshadow, which is a beautiful frosty deep green (Finally, after wanting it for so long) and Pink Nouveau Lipstick ( I have been on a pink-lip kick lately). Nice! :D I was looking to get the tinted lip conditioners. I love them, too. :) Have fun with your new acquisitions! Nice haul! I'm tempted to get 2N as well because it's such a pretty shade!